Oscar Podcast #60, the second in a week, welcomes the fantastic Kayleigh Donaldson of Pajiba to talk about Golden Globe and Screen Actors Guild nomination predictions. A healthy portion of the first part of the Golden Globe conversation centers around Get Out, both in its quality as a film and its likelihood as a Golden Globe Best Picture nominee. Talk about Call Me By Your Name, Dunkirk and the Darkest Hour are abound. The Screen Actors Guild conversation details the nature of nominees being dependent on the SAG nom comm getting screeners and how odd nominees can find their way here. Kayleigh and I both agree that the main category here, Cast in a Motion Picture is chock full of likely and worthy contenders and that it's going to be a bloodbath. Mudbound is a point of contention as to whether is lives or dies on SAG nominations or not. It's at this point that we take a sojourn into the wonder that is The Florida Project, which happens to be among both of our favorites of the year. We wrap with a few nominees we feel we might only see here at SAG (hint: mine if from Logan and it's not Hugh Jackman). You can see my official Golden Globe predictions here, and my Screen Actors Guild predictions will be revealed this weekend. This podcast runs 1h 9min with music. In this 59th Oscar Podcast I am joined by Kyle Buchanan, senior editor of New York Magazine and Vulture.com. We start by discussing the first round of critics' awards: the National Board of Review, New York Film Critics Circle and the Los Angeles Film Critics Association and what their wins for Call Me By Your Name and The Shape of Water could have on the upcoming (ongoing?) road to the Oscars. Throughout, Kyle peppers the conversation with his insight on voters, the importance of being the 'movie for right now' and we dip a bit into Screen Actors Guild talk, especially regarding Get Out (watch out for a new podcast for that this weekend). We wrap up addressing some of the controversies surrounding contender Three Billboards Outside Ebbing, Missouri and reactions to Call Me By Your Name. This podcast runs 1h 5m 25s with music. Those were the first words that Luca Guadagnino, the director of Call Me By Your Name, one of this year's biggest critical hits and Oscar favorites, said to me as I sat down to interview him. Truth be told, I did wear my red sequined Converse so I might have been fishing for that. Guadagnino himself was sporting fabulous red suede shoes so, of course, I returned the compliment. Both Luca and one of his film's stars, Michael Stuhlbarg, were in town for the Napa Valley Film Festival. Stuhlbarg was receiving a Spotlight award and had two films at the festival - The Shape of Water and Call Me By Your Name. 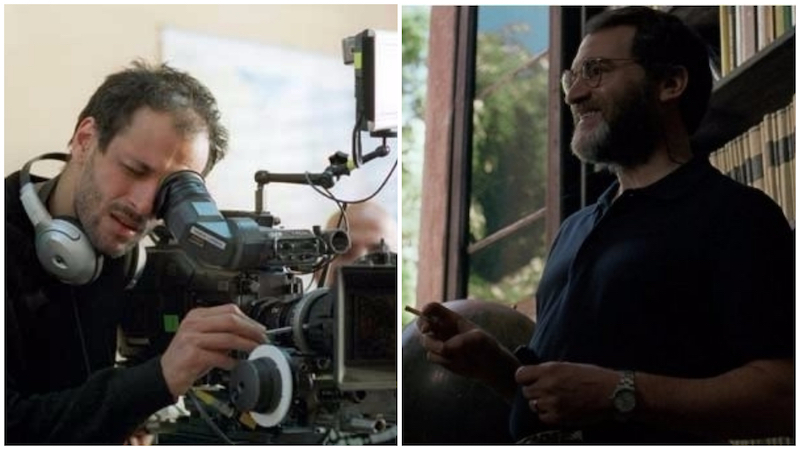 A fascinating duo, as Guadagnino was verbose and gave detailed and long responses to questions and Stuhlbarg with a more methodical approach to answers. Throughout the interview we talk about the journey for the book to get to film, getting Sufjan Stevens aboard and even a casting scoop the upcoming sequel (hint: it's someone from The Big Splash). This interview runs 36m 10s with intro and outro. With the Venice, Toronto and New York Film Festivals all having announced their slates for this year it was the perfect time to podcast. I am joined by Gold Rush Gang member Bryan Bonafede and we drill deep into who is playing where and even Telluride, which doesn't announce until the weekend of the fest. Based on the type of premiere a film gets at one those other three gives us information on who is going to Colorado. We dig into Best Actress after it became official this week that Sony Pictures Classics has picked up FILM STARS DON'T DIE IN LIVERPOOL, giving Annette Bening the best shot of her career at an Oscar win. This unfolds to Supporting Actress where Melissa Leo dominates with NOVITIATE but we recognize that the category is pretty open in terms of nominations. We discuss four films outside the scope of the fall festivals that are (or, in one case, were) potential Oscar contenders: DUNKIRK, GET OUT, DETROIT and THE BIG SICK. We have a lot to say about Fox Searchlight's THE SHAPE OF WATER from Guillermo del Toro, which we think could be the real Best Picture contender this year and certainly has the best chance at the highest nomination total come January. We close mentioning the new president of the Academy, John Bailey, and his predecessor Cheryl Boone Isaacs, who leaves behind a legacy unlike any president before her. This podcast runs 1h 45m with music. After two months of no podcasts, I return for #54 with special guests Júlia Guimaraes and David Acacia. David is an AW member as well as a member of the International Cinephile Society. He guested on last year's post-Cannes podcast and he's back to spill some tea on his faves, what he didn't like and the general 'meh' feeling of this year's festival. Bear with this podcast, folks, as David's connection goes in and out so much he sounds like he's reporting from the Black Lodge in Twin Peaks. Júlia, however, comes up with a clever tactic to overcome this. The podcast covers the Cannes prize winners and their possibility as awards contenders as we move through the season. With The Beguiled, The Killing of a Sacred Deer and Wonderstruck there are certainly some that could find themselves with Oscar attention. We also talk about the foreign language film contenders from the festival, including Palme d'Or winner The Square, Grand Prize winner 120 Battements par minute and Jury Prize winner Loveless. We dig into the female representation of the in competition films, which jury member Jessica Chastain found disturbingly lacking (her press conference convo started a viral firestorm). We finish up, of course, talking about Nicole Kidman's 70th anniversary prize, bestowed on her for her body of work in this year's festival (The Beguiled, The Killing of a Sacred Deer - both in competition - plus How to Talk to Girls at Parties and Top of the Lake: China Girl. This podcast runs about 1h 45m and if you make it all the way to the end despite David's dropping in and out I heartily salute you. This 53rd Oscar Podcast, the first of the 2017-2018 season, breaks down the main contenders right now and who could be in the future. With CinemaCon last week, we got some insight on a few high-profile Oscar contenders like The Greatest Showman, Suburbicon, Downsizing, Wonderstruck and Darkest Hour. On the flip side, we are still very much in the dark about other films like Kathryn Bigelow's Untitled Detroit Riots Project, The Current War, The Post, and mother! We talk about the impact, if any, the buzz for CinemaCon films will have on this month's predictions and also dig deep into where things stand in a post-Moonlight Oscar world. Will the pendulum swing back to an OscarsSoWhite year? On this 52nd Oscar podcast, the last of the 2016-2017 awards season, I'm honored to have AwardsDaily's Sasha Stone and Ryan Adams as guests for the post-Oscar post-mortem. After last night's historic win for Moonlight in Best Picture and an announcement fiasco unlike anything the Academy Awards have ever seen before, there is a lot for Stone, Adams and myself to talk about. Between our personal appreciation for Moonlight (and La La Land, for that matter) the conversation traverses politics and emotions as we analyze the academic reasons for the film's success and why it was so important that it won. We cover the perceived backlash and controversy that arrived late for La La Land, what streaks and records were broken last night and which ones held true, including that Best Actor SAG stat where we saw Denzel Washington lose to Casey Affleck. This podcast runs 1h 36m with music. Well, here we are. The last prediction podcast of the 2016-2017 Oscar season. I am joined by Gold Rush Gang members Kenneth and Evan for a deep dive into all 24 categories, starting off with the last batch of guilds that announced and using them as the jumping-off points for those Oscar categories. That carries us into a conversation about Hidden Figures in this race, a film that's done very well with the guilds even though it has only three Oscar nominations, none of which it's a frontrunner for. Then we hit a pair of highly competitive races, Best Actor between Denzel Washington (Fences) and Casey Affleck (Manchester by the Sea) and Best Supporting Actor between Mahershala Ali (Moonlight) and Dev Patel (Lion). Here is the itinerary/agenda of the podcast. This podcast runs 3h 4m with music. In our 50th Oscar podcast, I am joined by Gold Rush Gang member Bryan Bonafede. With BAFTA behind us, Bryan and I dig deep into that Dev Patel win and how much it and Lion's recent surge will impact the Oscar race. We also cover most of the tech categories, their history and correlation with Oscar and where BAFTA might have convinced us to change our Oscar rankings. La La Land lost Costumes, Production Design, Film Editing, and Sound so we look closely at the films that won these, compare them with recent guild announcements from the Art Directors and ACE Eddies as well as upcoming ones like Costume Designers and both Sound guilds. The battle for Best Actor is next and it's a battle between the overwhelming critics' winner Casey Affleck (Manchester by the Sea) and two-time Oscar winner Denzel Washington (Fences). Between personality, awards history and checkered pasts, this is a category ripe for surprise and we detail the reasons we've chosen who we've predicted to win. We also look at the Visual Effects category where, while we both agree that The Jungle Book is the undisputed frontrunner, we each make a case for a possible spoiler in Deepwater Horizon and Kubo and the Two Strings. With the Writers Guild of America this weekend we look at how, or if, the winners there will have much impact on possible Oscar results since category placement and eligibility between the two bodies don't match up very well. That said, Bryan and I both agree that at WGA the race for Original is between La La Land and Manchester by the Sea (where Moonlight is nominated) while the Adapted category (where Moonlight is Oscar-nominated) looks like a fight between Arrival and Hidden Figures. WGA predictions will be up tomorrow. Don't fret, we end with talking about Best Actress and just how far ahead Emma Stone and if a chance for an Isabelle Huppert spoiler is in the cards. This podcast runs 1h 36m. With two of the three major guilds (PGA and SAG) having announced their winners, Gold Rush Gang member Júlia and I break down what the winners mean in terms of the Oscar race. From the surprise wins for Hidden Figures and Denzel Washington (Fences) at the Screen Actors Guild to La La Land's march to an easy win at PGA, there's actually a lot to talk about. We start with the PGA and its correlation to Oscar's Best Picture and where we now see Hidden Figures in that race. Then it's on to Supporting Actor where we wax poetic on Mahershala Ali's speech (lots of swooning here) and Viola Davis (Fences) as she steamrolls through the season and her competition. Best Actress is next, where Emma Stone (La La Land) stands alone as the frontrunner but who is next - Portman or Huppert? I detail why Portman might not be the #2 people think she is and why I think she lost. Next is Best Actor, which threw us a big left turn. Is Denzel Washington the new frontrunner or was he all along? Finally, we talk at length about the win for Hidden Figures for SAG's top award. We close with predictions for next weekend's Directors Guild of America (DGA) awards and the impact on the Foreign Language Film race from the Trump administration's devastating anti-Muslim ban in regards to Iran's The Salesman and its director, Asghar Farhadi. This podcast runs just over one hour. Ok folks, get comfortable. This 48th Oscar podcast, our final Oscar predictions podcast before the nominations are announced on Tuesday the 24th is epic. 3h 25m epic. But don't be afraid; Chris, Bryan and I tackle all categories (except the shorts, sorry shorts) with laser precision and detail, offering up potential spoilers, justifications for crazy predictions as well as wondering if too much agreement within the group means we could be dead wrong. We know La La Land will dominate on Tuesday but who will surprise? Is Nocturnal Animals the contender that BAFTA and the Golden Globes think it is? Is Isabelle Huppert safe? What about Best Picture - will we see all nominees come from the PGA top 10 or is something lurking in the dark? Will there be eight or nine nominees? What's the weakest link? The answer might surprise you. After all, it's the Oscars, anything's possible. In this 47th Oscar podcast, Gold Rush Gang member Júlia and I have a lot to discuss. The Golden Globes were last week and brought with them the deluge of La La Land's history-making wins, the shocks of Aaron Taylor-Johnson and Isabelle Huppert and the triumph of Moonlight in the 11th hour. Then, BAFTA nominations showered Nocturnal Animals with love and held back on Moonlight. PGA and DGA showed us that Harvey isn't out of the fight just yet as Lion roared back to life, landing at both guilds. All this and more on a supremely succinct podcast that runs less than an hour.